If there’s one thing I truly love about Kunihiko Ikuhara, it’s his bizarre sense of humor. Revolutionary Girl Utena had a kooky sense of humor to go along with all the crazy melodramatic flourishes, and so too does Ikuhara’s latest series, Mawaru Penguindrum. What is key to this is that, like Utena, it is established early that the Japan of Mawaru Penguindrum is a Japan that is formed of metaphor and imagery, and is therefore not a world where what the viewer sees is meant to be taken literally. This knowledge then frees the staff to go wild without having to worry about silly things like logic and reality. I admire Ikuhara for using this freedom not only for serious plot development, but also in the name of good, old-fashioned Fun. 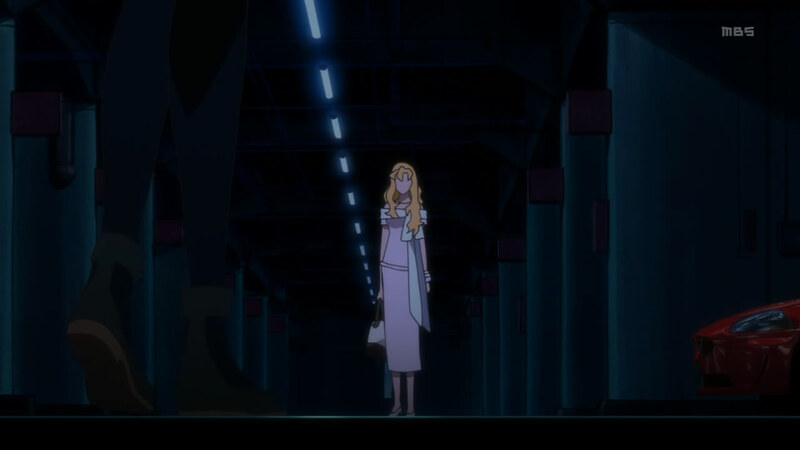 This scene in episode 17 of Penguindrum, when Masako and Yuri duel in a parking structure, is just plain fun to me. I’m a serious dork for westerns — love them, cannot get enough of them. Sergio Leone’s spaghetti westerns — in particular The Good, The Bad and The Ugly — are especially beloved by me. Masako and Yuri channel that spirit here: Every move they make is amplified to the highest degree. Every word they say is sharpened to the hilt and made to cut as deeply as possible. The click of Yuri’s high heels and Masako’s boots against concrete echo into eternity. The music — oh god, the music! — is perfect. There’s even a couple of Leone-style close-ups of eyes! But they don’t stop at riffing on a great western; the magical girl visual twist to the fight is a fantastic cherry on top of a wonderful scene. For Masako and Yuri, the stakes could not be higher: They both want someone back in their lives who means the world to them. The two of them act cold and ruthless, but their true desires make them two of the most passionate characters in Penguindrum, and that’s why the spaghetti western motif works so well. Leone’s visual style took the western — which already placed the harsh environment of the old west on a pedestal — and made it bigger, bolder and all-consuming. It takes a few elements and plays them up as much as possible, until what you’re left with is a pure emotion onscreen. The final duel in The Good, The Bad and The Ugly is drawn out so much that it should probably be ridiculous, but it never quite gets there because Leone and his crew have such command over what they want the audience to feel, and such confidence in what they’re shooting. That’s Penguindrum in a nutshell: It’s bold and ridiculous — not so ridiculous that you can’t take it seriously, but not so serious that you can’t appreciate the craziness.